As a convinced and occasionally convicted Baxian, I was keen to review the latest release in the Naxos series without the customary special pleading. After all, though we can still - just - count the number of commercial recordings on the fingers of one hand, it's surely possible for a 2000 reviewer to treat the 3rd Symphony as one of the accepted masterworks of the repertoire and cut to the critical chase. Ah, hubris! Even before that first bassoon solo had unwound its mysterious tendril, ghostly doubts had set in. Was the granite first movement really quite cogently argued? Did the glamour of the Lento really strike that deep? Were the Russian influences in the last movement really so seamlessly absorbed? Thankfully, by the end of the Epilogue's unique, enigmatic tranquillity I was firmly back in the fold. This is a great symphony, no shadow of possible or probable doubt whatever. End of special pleading. spasmodically drawn in by the Naxos performance, I found myself horribly tempted to blame the work. After all, David Lloyd-Jones's direction displays classical clarity of line; orchestral focus, dynamic nuances and tempi are generally well-judged; and though he launches into the Epilogue a mite feverishly, even this has the side benefit of pointing up its thematic and rhythmic growth from the main movement. The clean recording quality matches the approach - no previous version has registered so much of Bax's orchestral filigree, or had quite this dynamic range. Only, most of the time, the magic touch is missing. What's lacking? Perhaps the very detail of the recording cuts against the warmly familiar fog of romance, the atmosphere you can almost reach out and touch, which makes the old Barbirolli version on EMI so haunting. Under the spotlight of modern recording, I wonder how far the Halle's frequent executive slips would have dissipated that magic? Lloyd-Jones's reading is a model of clean, no-nonsense structural intelligence, decidedly preferable to Thompson's, waterlogged in the Chandos swimming-bath. But perhaps "no-nonsense" is the problem here, at least in so far as it limits the size and scope of Bax's emotional canvas. And while precision is a plus in so many places, it can sometimes sound like playing safe. Lloyd-Jones is significantly slower, for instance, more cautious than Barbirolli in that tricky first movement allegro. Bax also needs imaginative individual playing. As the recording highlights, much of this score has the intimacy of chamber music, and here some of the woodwind and string players of the Royal Scottish National Orchestra fall marginally short. Individuality may not be deemed much of a virtue these days, but although such limpid Bax is refreshing, phrasing can be an inch too rigid (1st clarinet a glorious exception) and orchestral poetry an inch too prosaic. Nor can the RSNO muster the weight of string tone the work ideally needs at the big climaxes, where the violins tend to go missing under the headstrong exuberance of the clean-winded brass. The string section is heard to noticeably better advantage in the comparatively lightweight scoring of the The Happy Forest, a sweetly delicate envoi to the main offering. 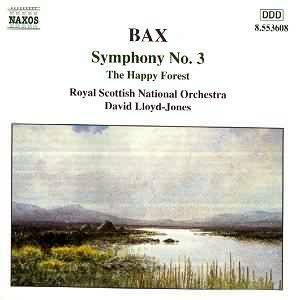 The Bax 1st and 2nd in the Naxos series have won golden opinions, and there's very little wrong with this 3rd either. The firm structuring of the symphony, and the coupling, put me in mind of Edward Downes's under-appreciated reading on RCA with the LSO, and respect for the Naxos performance similarly grows on closer acquaintance. Affection? Ask me in about thirty years. With a running time of under 54 minutes another filler wouldn't have gone amiss, but at this price nobody's going to be miffed - even though the performance of the Symphony doesn't quite capture that elusive glint of gold.